PS Vita update set for August launch in the U.S. and Europe. Disgaea 4: A Promise Revisited will launch in both retail and digital forms for PS Vita in North America on August 12 and in Europe on August 29, NIS America officially announced. The date matches that on NIS America’s distributor sales sheets from last month. The PS Vita game is an enhanced version of the original PlayStation 3 game, including new features and all of the post-release downloadable content. The original game had a cast and story that was widely praised as one of the best in the series, and this PlayStation Vita version offers players a chance to relive that adventure on the go, and with brand-new content! Disgaea 4: A Promise Revisited comes packed with in-depth gameplay, everlasting value, and the great sense of humor you’ve come to love. The graphics engine truly brings Takehito Harada’s characters to life with fluid animations and high definition details. Create your own political party and take advantage of a slew of new battle and strategic features expanding upon the already staggering replay value. Grab your PS Vita and stop the Corrupternment’s evil doings with the power of…sardines? Tons of bonus content, including brand-new scenarios exclusive to this release, adding more backstory to some of your favorite characters. 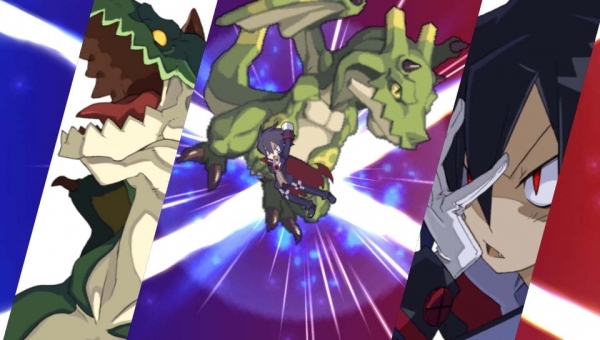 New characters, as well as cameo appearances by characters from previous Disgaea games. A new tier of spells, job specific techniques, as well as other gameplay enhancements. Includes all of the downloadable content that was available on the PS3 version. Brand new music tracks have been added for a total nearing 100 enjoyable tunes. Features beautiful hi-res sprites that look even better on the Vita’s screen.